Is this what we should be looking forward to.. Some of us are few paychecks away from being homeless. Kathleen Wolf never dreamed of spending her retirement in Iowa. The 68-year-old Californian had a change of heart after filing for Chapter 13 bankruptcy. Ms. Wolf was a millionaire whose fortune, built on buying and selling homes, collapsed in the financial crisis. Her bank balance fell to $15. Ms. Wolf said her debt-repayment plan, which eventually left her with about $1,000 a month to live on, made clear she had to leave Monterey, Calif., the central-coast city where she lived. She looked online, as long as 15 hours a day, for places with a low cost of living. In August, she landed in an Iowa town of around 700. During her nationwide search, Ms. Wolf found that life in affordable communities brought trade-offs. "These places never gentrified. They have undesirable weather," she said. "They have no yoga classes." Yet Ms. Wolf's journey from tony West Coast to rural Midwest has afforded, to her surprise, a measure of contentment, as well as counsel for the nation's 75 million baby boomers. As a group, it is widely known they face a wider savings gap than past generations. What is less well documented is how they have piled up more debt, too. People in the US ages 65 to 74 hold more than five times the borrowing obligations Americans their age held two decades ago, according to an analysis of federal data by the Employee Benefit Research Institute, a nonpartisan, nonprofit policy researcher. Paying it off won't be easy. Median savings for US households nearest retirement age has dropped 32 per cent in the past decade to $14,500, according to an analysis of federal data by the Economic Policy Institute, a left-leaning think tank. The financial crisis weakened many households through lost jobs, pay cuts, home-price declines or a combination of all three. 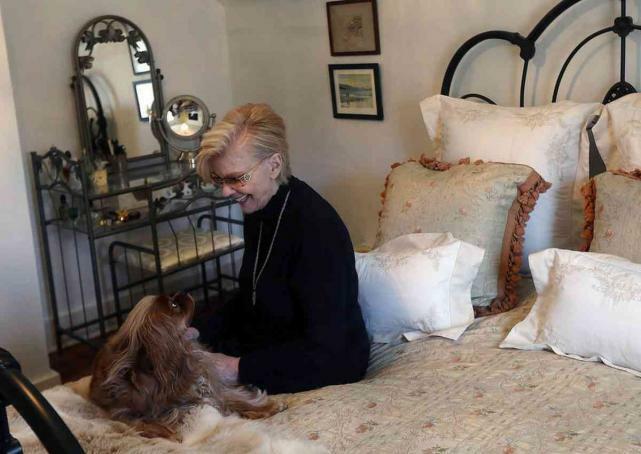 Kathleen Wolf and her dog Cooper in the bedroom of her new home in rural Iowa. Facing five times the debt of previous generations and relatively small savings, many retirees are making fundamental lifestyle changes; Ms. Wolf trades California for Iowa. before them, a mix that is crimping their hopes of a comfortable retirement.